Ballistic Advantage is one of the household names in AR15 barrel manufacturing. They have offered solid products for years and they do it at a fair price. Not the cheapest, but nowhere near some of the high costs of a premium 5.56 pipe. Does middle of the road cost equal middle of the road performance? Let’s start with a preface. I don’t own a machine rest, and the greatest optical zoom I have on hand is 10x. I shoot outdoors. I am the biggest variable in the accuracy equation. I always like to remind my readers that I am like you. Not many of you own a machine rest, some of you might have a good 16x variable, some of you may max out at 6x with a LPV, some of you reload, some of you don’t. So since I am some of those and none of others, my tests represent the practical accuracy I could get with the equipment I have. I, ME, MY, am the biggest variable in these tests. My methods, I believe, are fair. I look for groups above 7 shots to represent statistical significance. I mark out flyers if the deviation is far outside the group. Don’t like it? Analyse it with your own software. I hide nothing! This is my second stainless steel BA barrel. I have found, overall, the stainless BA barrels to be handsome, reliable, and as good as any other practical barrel I have installed on any other rifle. My 16 inch Hanson has been underwater many times and has never failed me despite murky conditions and a wet bore. Extraction, feeding, and accuracy are on par with any other product. 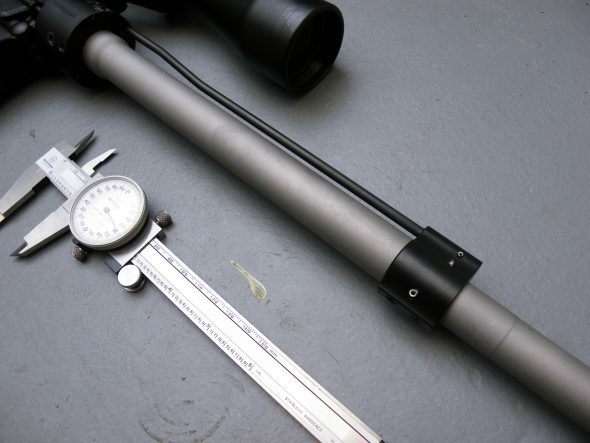 My newest steel barrel to test is the Ballistic Advantage SPR profile 16 inch Mid Length. I decided that this barrel will give us a good sign of the potential performance you can get from a BA barrel. Note the visual difference in diameter from a Gov’t profile vs. the BA SPR profile. The BA barrel is one STIFF mutha. The barrel is a matte stainless, bead blasted finish. The receiver extension is nickel boron coated with M4 feedramps. It weighs in at 35 oz naked. My barrel came equipped with a pinned gas block and an A2 flash hider. Installation yielded no concerns other than I flubbed with the punch and marred the gas block. I did not bed the barrel. I installed the barrel with a BAR style barrel nut, a strap wrench, and simply lined the BAR nut to the first gas tube hole. I placed a Aero Precision 12 inch MLOK Quantum hand-guard over the barrel. Test Rifle as equipped: BA 16 inch SPR, Geiselle SSA, Bushnell Elite 10x, Vltor A5 Stock, BA bolt and carrier. Accuracy testing requires multiple trips to the range with different products. As such, I had two separate range trips and attempted multiple loads. I tested XM193 x2 sessions, Federal Gold Medal Match x2, 52 Grain ELD reloads x1, and 55 VMAX reloads x1. I shot for 10 round groups as 7 shots or more represent a statistically significant group size. I evaluated group size with accuracy analysis software. If I find there to be flyers so far outside of the bulk of the group, I omit them as they are likely shooter error. I shot two sessions with the session 1 being a cooler, but breezier day, and session 2 starting out cool but quickly becoming miserable not long after I started shooting and it affected my performance BIG TIME, but I will note that in the targets. XM193 is a common, standard fodder. I used Winchester NATO 55 grain ammunition and expected groups of 1.5 to 2 moa for this ammo. The first range session was cool(er) and I felt more relaxed firing the below group. Below, we can see that the bulk of the rounds grouped tight at 5 o’clock of the diamond. I have 8 shots present in the first group and omitted two very distant outliers. Consider that 80% of my shots performed to 1.3 MOA with that group and simple run of the mill XM193. This is excellent for M193 as it is typically considered 1.5-2 MOA ammo. My second range session suffered from heavy mirage, high heat, and I my performance deteriorated significantly from the first group. Since I could not find flyers outside the bulk of the group, no shots were omitted from the 10 round group. Session 2: Same bullet as above, poor shooter performance. My second group suffered from all the ailments mentioned, and I feel that my performance deteriorated more than anything the barrel did or didn’t do. This was the same lot of ammo as the first session. The morning started at 85, but by the time I shot my XM193 the temperature was likely 89-90. I posted this poor group not as an example of what the barrel can do as we can see it can sling M193 with excellent accuracy… but I wanted to show readers how much groups can open if you are hot, tired, and dehydrated. Mental focus out the window! FGMM is considered top of the line factory ammunition. Topped with a 77 grain sierra match king, this ammo is one of the best factory loadings you can buy. At more than a dollar per pull of the trigger, it better be. This is exceptional performance. Nine shots produced a statistically significant group size of 1 MOA. My second range session was the hot, humid day. After firing the XM193 with such poor performance prior, I got up, drank lots of water, cooled off, and really concentrated on settling in on the rifle. The results were dank. The above group is a 10 round group with the two distant outliers omitted. 8 shots of FGMM were able to produce a .59 MOA group and a mean radius of .19! That’s phenomenal performance. 80 percent of the groups data is lost by concentrating on the two furthest points. For posterity sake, here is why I omit the distant outliers: suppose we measured the above group by the two furthest points. In doing so, the reported group size is 1.33 MOA. By only measuring the two furthest points, we are losing much of the statistically significant data. Even if the two outliers were the barrel or bullet’s fault (much higher likelihood that they are shooter error) we still see that 80% of the shots will land within .18 MOA of group center. Since we have a high degree of precision and a group size of 7 or more shots (which represents statistical significance) then I am happy to say that the barrel wowed me the second session out with a .59 MOA / .18 MOA mean radius with 80% of my shots. 8 Rounds, .59 MOA. Fantastic. Note: by the time I shot the FGMM, the temperature had risen closer to 93 degrees, not 85. Two individual reloads were brought out for one session each. My 53 ELD bullet, and my 55 grain VMAX loading. Neither of my handloads wow’ed me with this barrel. Each barrel is unique, and we often have to look for that “right load” to really make a product sing. Both of these loads were able to produce MOA or under out of another rifle with the same recipe. In the case of the BA SPR, it did not favor my hand-loads. I omitted no shots from the below groups as I didn’t feel comfortable calling any shots as being distant outliers. Honesty is important. The above groups represent a blend of barrel, bullet, and rifleman performance. I have selected to show you everything this barrel did for me during the last two outings. I have hid nothing. The Ballistic Advantage SPR profile barrel has revealed it loves it some heavy match bullets. As a baseline, we know that with the right load, the BA can shoot lights out. Buying some FGMM and hitting the range basically gave me a turnkey 600-700 yard Recce style carbine. With our XM193 control, we had a sample of 1.3 MOA and that is damn impressive for bulk loaded mil-spec ammo. My handloads weren’t the right formula. That’s OK though. Each barrel is different. The FGMM has illustrated to me what the barrel is capable of even if it didn’t like my handloads. Working with the gun further may yield even better results than the factory FGMM! Next range session, I will be shooting some heavier handloads in addition to more FGMM. I hope I can place all ten into .6 minutes or less! Keymod vs M-Lok: Which Will Set the Standard? Good shooting. It looks like you have a winner. I’m still clinging to my chrome lined tubes, but that BA is a shooter. That’s really nice! I have been considering getting one of their spr barrels for a while to play with as a sort of “urban sniper” SHTFantasy upper. Good write up. I’m going to give this a go with my 18″ Noveske SPR and some black hills 77gr stuff. Have two of these. 2016 purchased. Want to say I got them for sub $150 from Monmouth Reloading (now Arm or Ally). They now make fluted versions of the same which save 1/2 lb. BUT for same price as the BA fluted barrel, I’d probably go w/ one of the faxon fluted match barrels and their 5R rifling. Regardless, I get sub 1 MOA w/ the American Eagle 50gr ballistic tip varmint loads as well — this barrel being in my coyote rig. *I went w/ the Vltor clamp on gas block, and the barrels in a Gen 1 M4E1 Aero Upper w/ Mlok rail (purchased at a good discount from Schuyler Arms in 2013 or 2014 IIRC). Of note, use a FDE Aero Lower, their previous Gen 1 lower due to Gen1 and Gen2 FDE colors on Aeros being different. The newer ceracoat is darker and slightly glossier than is found on earlier generations. The gas block is below the handguard and I’m a believer that pinning and clamping gas blocks are both less than ideal for accuracy. Nice write up on this particular barrel. I’ve had the same barrel for a couple years now with a pretty close setup using A5H2 but with a Leopold 4×12 instead. My results pretty much mimic what your data shows. I do use a Harris bipod however. I shoot 5 shot groups counting everything after a cold bore shot and have tried M193, M855, MK262 along with various 55, 69, 75, and 77gr flavors of Gold Medal Match and Black Hills red box ammo. I have found 69gr. Gold Medal Match SMK shoot the most consistent for me and produce the tightest groups. Thanks for the write up looking forward to part rwo. Great stuff. I built a rifle last year with the fluted version of that exact barrel, vg6 Epsilon brake, m4e1 receiver set, 15″ handguard, psa np3 bcg, A5H2, and a Geissele Tricon trigger. Super smooth and accurate as stink with irons or my red dot with all XM193. Great to know how far I can push it if I get the chance to consider some good glass and long ammo.